I know, I know. It's the middle of winter! Why flamingos?! Well, because we wanted to, darn it! 😁 And our Southern Hemisphere crew members deserve to create stuff appropriate to their current season too. And I can dream of warmer climes while our local weather is anything but warm. 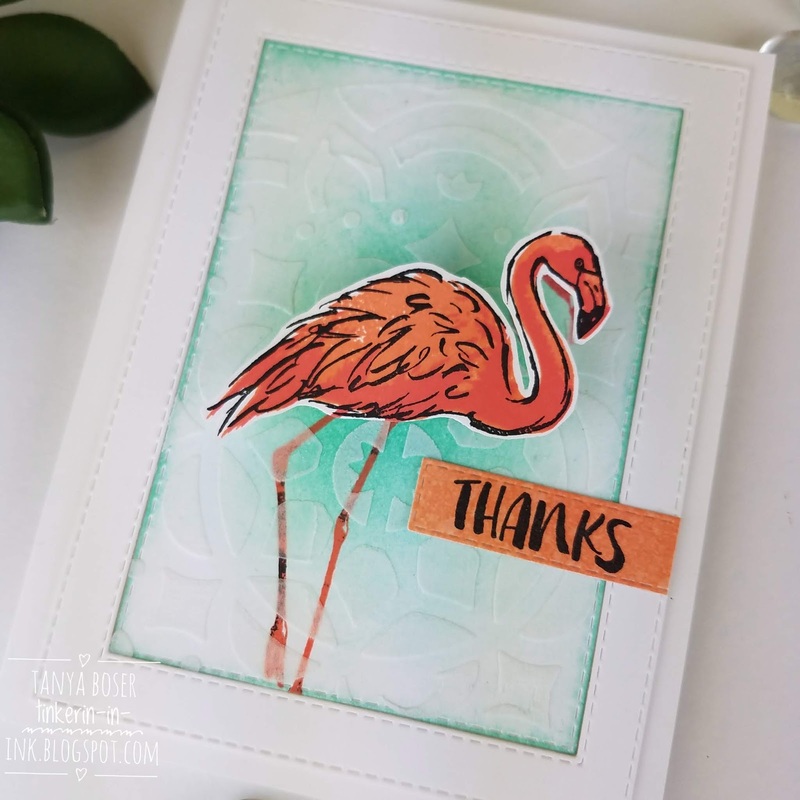 So Fabulous Flamingo, here we come! What is the Stamp Review Crew, you ask? 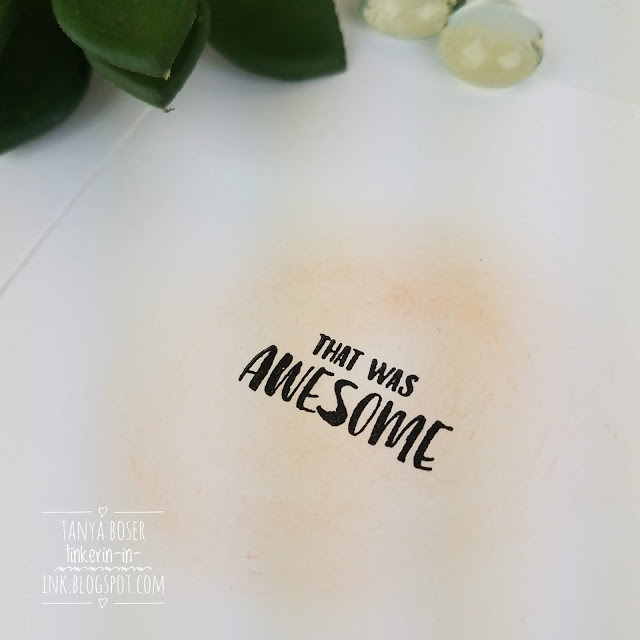 We are an international group of Stampin' Up! demonstrators that gets together to do a blog hop on the first and third (and sometimes on a fifth) Monday of each month. For each hop we chose a single stamp set for us all to use, and then we let our creativity loose! We have a blog with all of the hops archived, so you can hop through any of the hops any time. 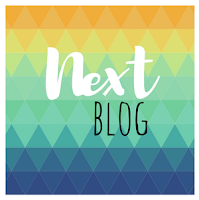 Click here to go to the blog to see all of the hops! To go to the specific post for this hop, click here, or on the banner above. 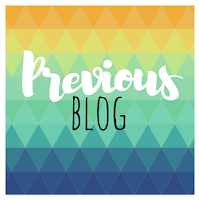 If you are following along in order, then you have just arrived from Heidi Baks and her amazing creations! 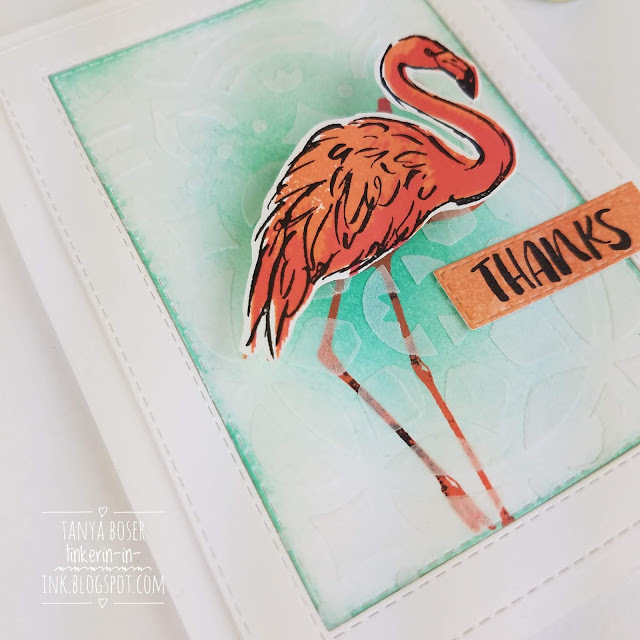 I had this thought in my head for a framed flamingo on an action wobbler that I just could not let go. So here it is!! I envisioned a salmon-y pink for this flamingo, I used Grapefruit Grove with Flirty Flamingo, and it was perfection! Of course, I had to get the Rectangle Stitched framelits, so I created a frame with the 2nd and 3rd largest dies. 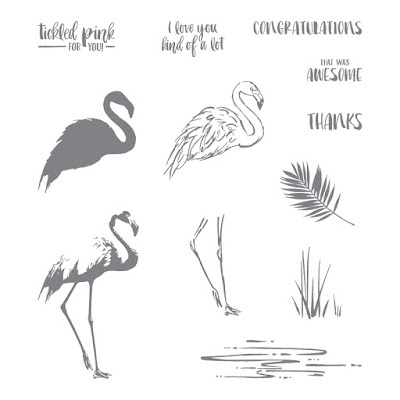 Behind the flamingo is a background sponged in Coastal Cabana, then the legs stamped in Flirty Flamingo dabbed with black ink. 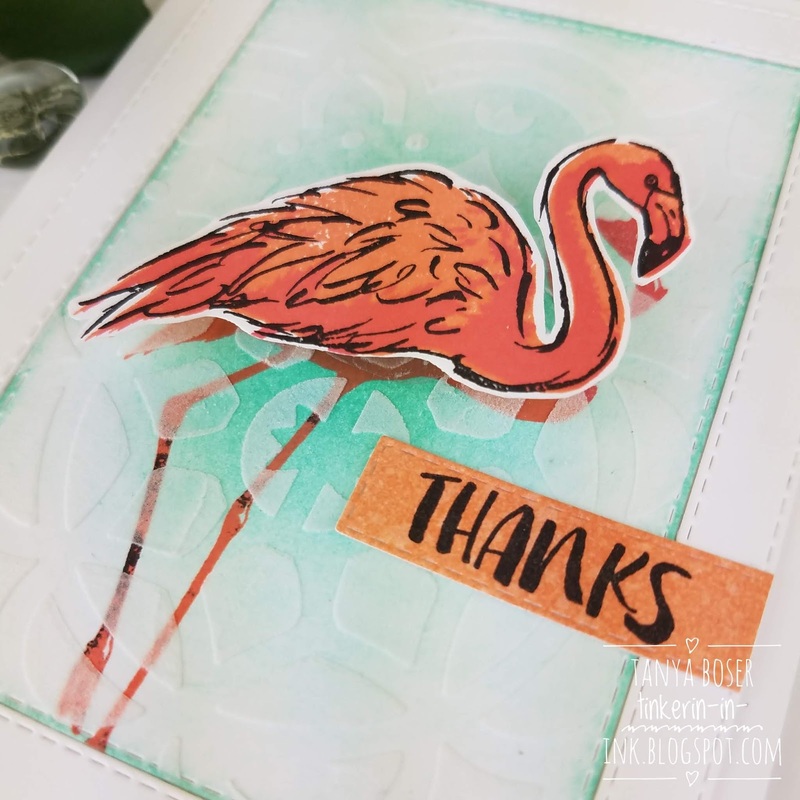 Texture was added with Embossing Paste applied over it using a Pattern Party mask. And the flamingo body was fussy cut so it could be added with an Action Wobbler. 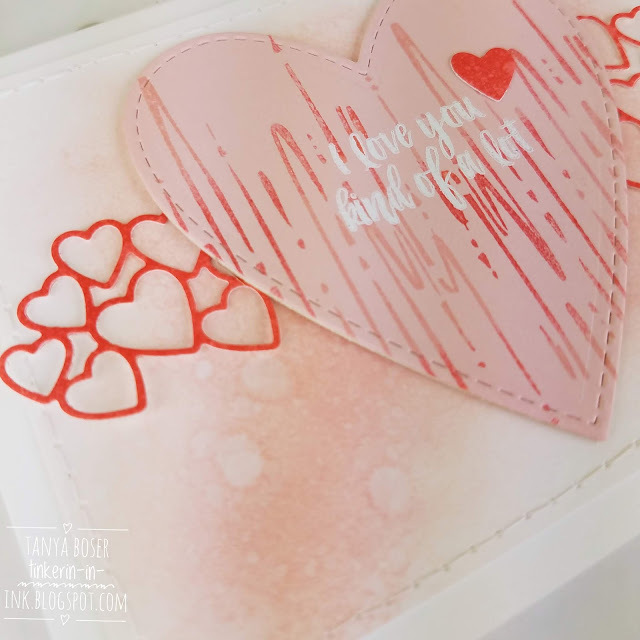 The sentiment strip is some Thick Whisper White sponged with Grapefruit Grove, spritzed with Pearlized water, and cut with a Rectangle Stitched framelit. Inside was lightly sponged with Grapefruit Grove, and the sentiment was added. Then I got to thinking that the water image would be a great vertical repeating pattern. And then thought it looked like an abstract representation of a cardiac rhythm. 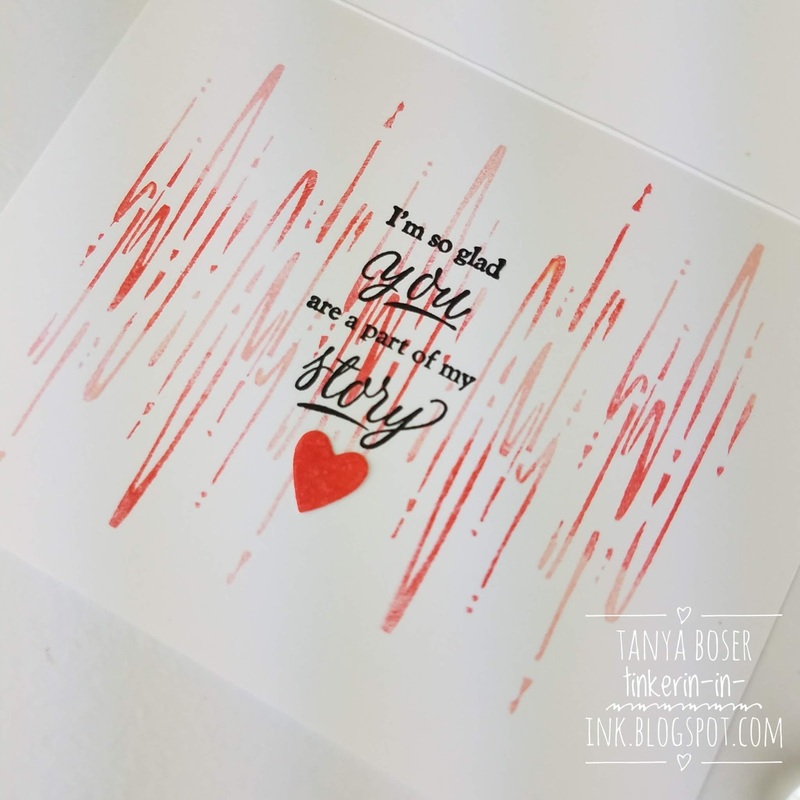 So, it was inked with Powder Pink, dabbed some Poppy Parade on the inked stamp with a sponge, and stamped onto a piece of Powder Pink cardstock. A bunch of times. Alternating the Poppy Parade sponging between the center and the ends. The sentiment is white heat embossed on the die cut heart. The background panel is sponged with Powder Pink and spritzed with Pearlized water, and for-real stitched. 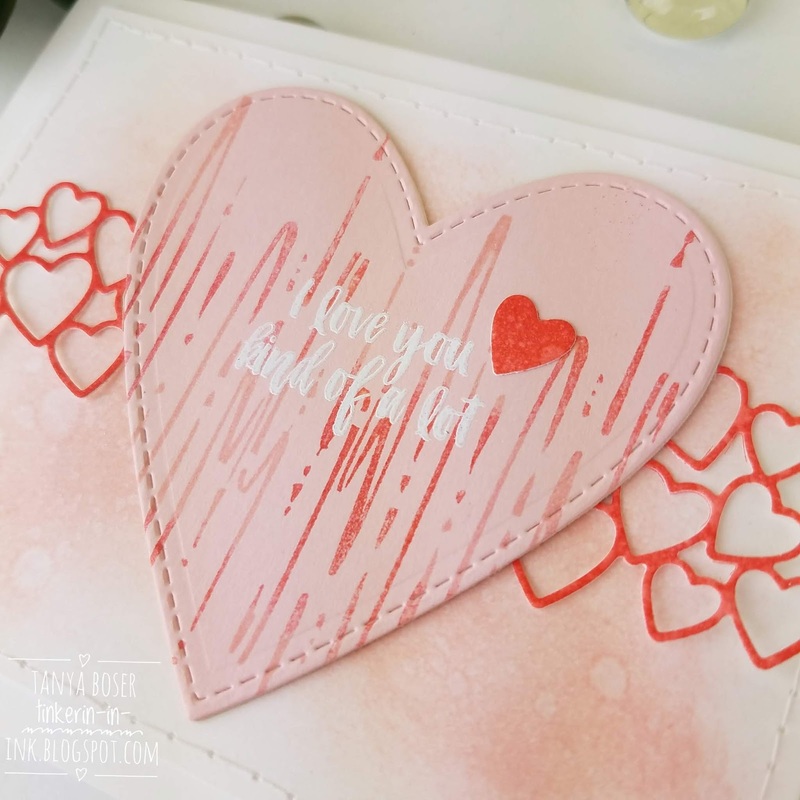 The clusters of hearts started as Thick white cardstock sponged with Poppy Parade and then die cut. The fall out hearts are put to work also. Inside, I stamped the water image the same way as on the heart, and added this amazing sentiment from the Sale-A-Bration set, Part of My Story. There is another fall out heart put to use here. I have a bunch of them to use in future projects! Next up is Stesha Bloodhart. I am sure she will have some stunners! Wow! You outdid yourself, Tanya! Love the background, the wobbler and the fun interior....amazing! I love your creativity! Using the water image for something completely different was so brilliant. Genius idea for the heart! I love things that are a little out of the ordinary. I love how your creative brain works! You always add little details that leave me asking in a whiny voice why I didn't think of that! These a both fab but who can go past a wobble bird!!!! You are a creative genius! Love your projects each and every week. Big hugs.